Golf is front and center this week with the Dell Technologies Match Play tournament. Along with tennis, it’s one of those sports we are fortunate to be able to play year-round in Central Texas. A common injury that affects both golfers and tennis players is an overuse injury to the elbow, known as either Golfer’s Elbow (medial epicondylitis) or Tennis Elbow (lateral epicondylitis). It occurs when the joint and tendons become overworked and inflamed from the repetitive motions of swinging a club or racquet. Tenderness or numbness in the elbow or forearm as well as difficulty grasping or gripping things can be a sign of either condition. 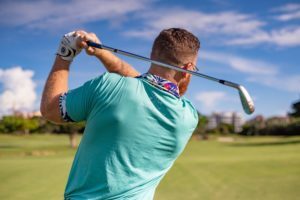 Pain from Golfer’s Elbow tends to be felt on the inner side of the arm and elbow; Tennis Elbow is most often felt on the outer part of the elbow and forearm. Tennis Elbow affects the tendons along the outside of the forearm that flex the hand and wrist backwards and forwards. Golfer’s Elbow affects tendons on the inside of the forearm that control the fingers. At Texas Orthopedics in Austin, our sports injury doctors recommend rest, icing the elbow, and anti-inflammatory medication (like Ibuprofen) to treat minor pain. Using an athletic brace to support the elbow joint can also help. For elbow pain that is severe, and you are having difficulty completing basic tasks like opening a door or lifting a cup, you may need a more serious treatment like a cortisone injection or surgery to repair the damaged tendon. To make an appointment with one of our board-certified hand and wrist surgeons or elbow doctors, please visit us online anytime. Texas Orthopedics has a convenient location in Lakeway where both golf and tennis are popular, as well as seven other clinics throughout Central Texas to best serve our patients.